> Schneider Electric > Which arc flash analysis method is right for you? Recent changes in workplace safety regulations have heightened the awareness of hazards associated with electrical arcs. The hazard level must be quantified and workers properly protected before entering proximity of exposed energized conductors. NFPA 70E provides the guidelines for work involving electrical hazards and the selection of arc flash protective equipment. IEEE 1584 has been the existing standard for calculating the arc energy levels at different points in the electrical power system. However, NFPA 70E also provides the option of using the Arc Flash Hazard PPE Category task tables for PPE selection. These tables provide pre-defined levels of PPE, which are based on the available short circuit current and the speed of the overcurrent protective device. In order to properly apply the tables, some degree of electrical calculations must be performed. Otherwise, the tables could be subjected to misuse if they are applied without knowledge of the necessary calculations. 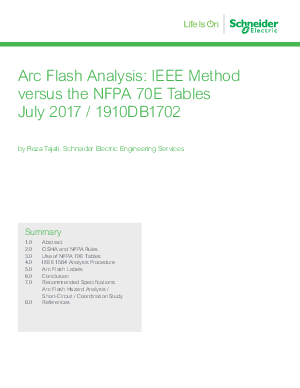 versus the NFPA 70E Table, the basic differences between the IEEE 1584 method and the NFPA 70E PPE Category are discussed. A recommended specification is also provided for facility owners who are interested in achieving compliance with the regulations.